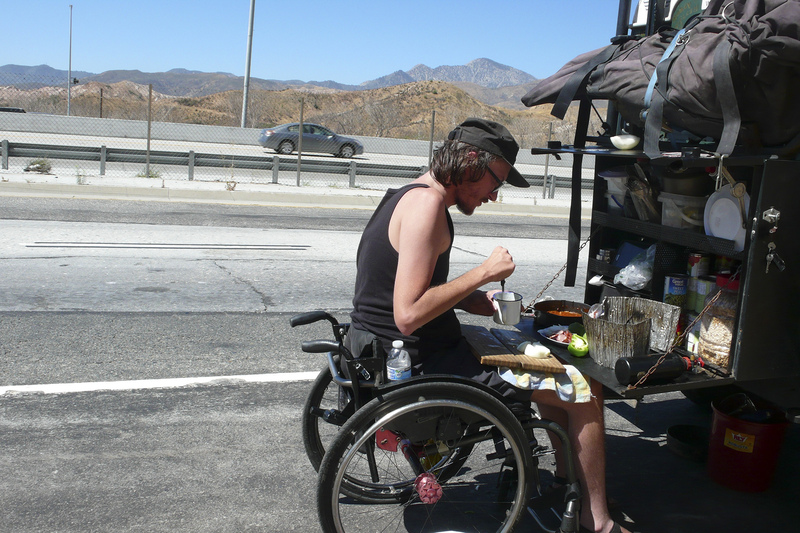 This is not the end of a wheelchair trip, but a temporary suspension. 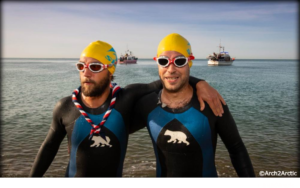 Michal Woroch and Maciej Kaminski, due to the broken engine in their vehicle and the approaching winter in Alaska, are returning to Poland, but only for a few months though. Powerful bang. It was much louder and more menacing than the previous one. 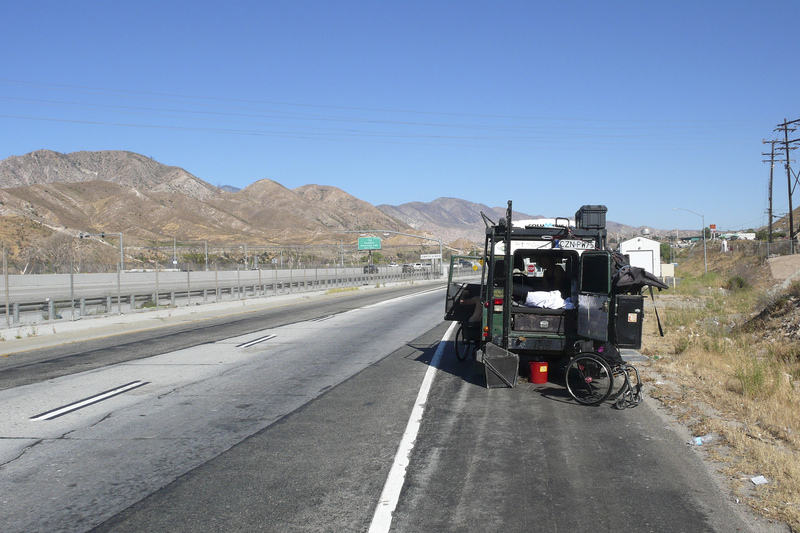 Defe still continued to roll on the highway with the engine that had just finished its life. It stopped at the side of the road near the exit for the truck stop. After a moment of silent surprise, Michal said, “Lena, we‘re not gonna get to the Grand Canyon!” “We’re not gonna get to Alaska either” – added Maciej. 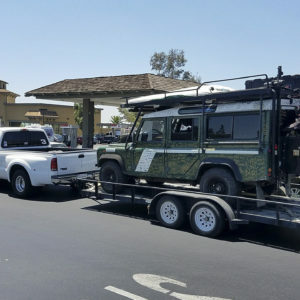 The Land Rover Defender, called Defe, or Charapa -which is not only a means of transportation, but also a symbol of the wheelchair trip of the two wheelchair bound friends Michal Woroch and Maciej Kaminski,- broke just two hours after leaving Los Angeles. They were heading to Arizona , to the Grand Canyon. 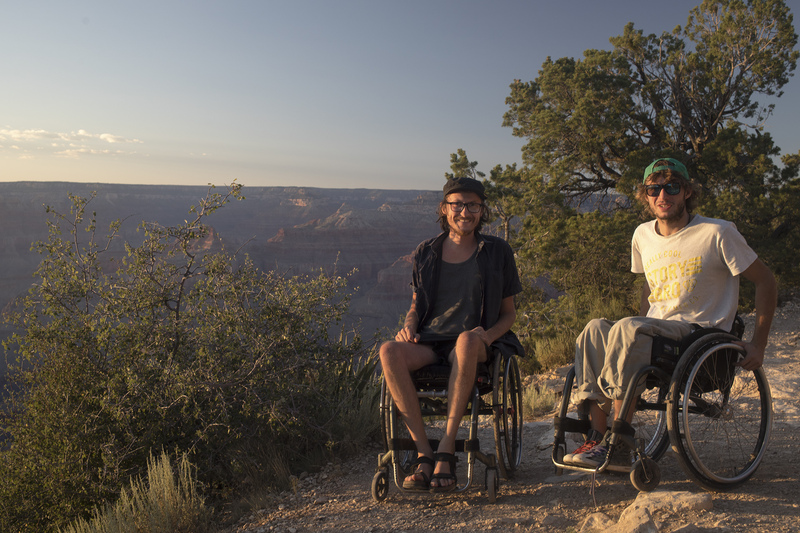 Michal promised to show this miracle of nature to his friend Lena Szczesna who had come to the United States to taste what their amazing two-wheelchair expedition was like. It was one o’clock in the morning. 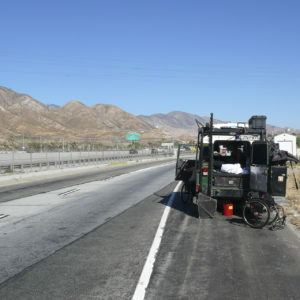 The California desert, dry and hot from the burning sun during the day, stretched on both sides of the four-lane highway. “We had to move the car further to the right, because it was crossing the white line, therefore posing a threat to other cars and to us,” reports Lena – “Six thousand pounds! Impossible? With these guys everything is possible. Together with Maciej we swung Defe and slowly we managed to push it about 60 feet into a safe place. We decided to sleep in the car and send a message from the satellite phone in the morning that we needed help”. When the morning came, I received the text from Michal and Maciej that Defe’s timing belt probably broke again, although the symptoms of the problem sounded much more serious. I contacted the Los Angeles workshop from which Defe had just left after a thorough repair with a brand new belt. 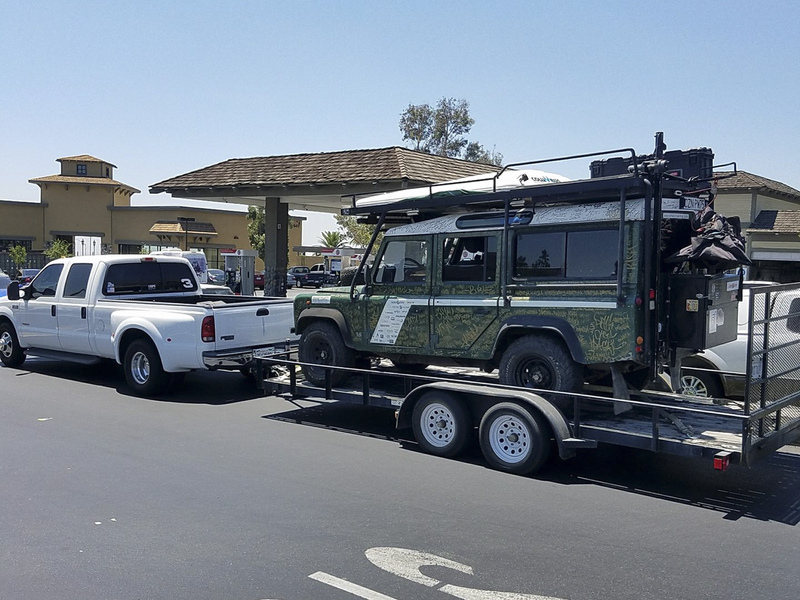 Steve Mills, the owner of the British Car Center and an expert in Land Rover repairs, immediately sent the towing truck to bring the vehicle to the shop to repair it. Unfortunately, it took a while, and it began to get hot in the desert. 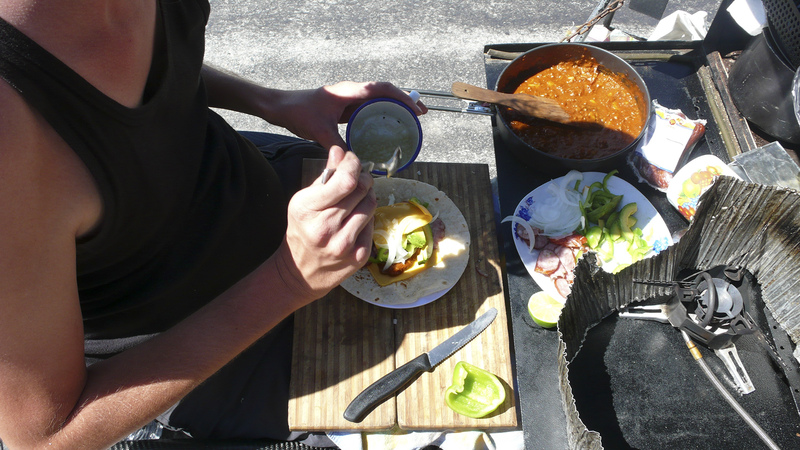 Just after a breakfast prepared by Michal (“delicious tortilla with sauce and vegetables, and also Polish sausage”) the travelers started a hide-and-seek game with the sun. They were orbiting the car, following in the footsteps of an ever-decreasing shade, that was giving them at least a little bit of protection from the merciless rays of the sun. 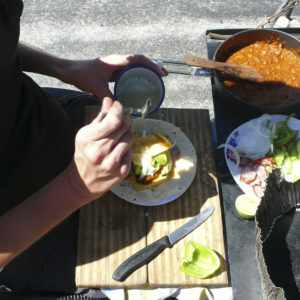 “The wind, the noise of the cars and the burning sun finally made us get inside the vehicle” says Lena. – “Maciej on the roof, I with Michal inside Defe. We knew that help was on the way, but we did not know how much longer we would have to wait. My mind was calm, but the body exposed to such a heat had enough. My head started to spin. Michal ordered me to drink water, and I was drinking! More! So was drinking more and more. I began to feel nauseated but after a while it passed, and the wet compress on my head helped me cool down. If not for Michal I think I would have passed away” – she adds with a laugh, “with a smile on my face, but I would have passed away. 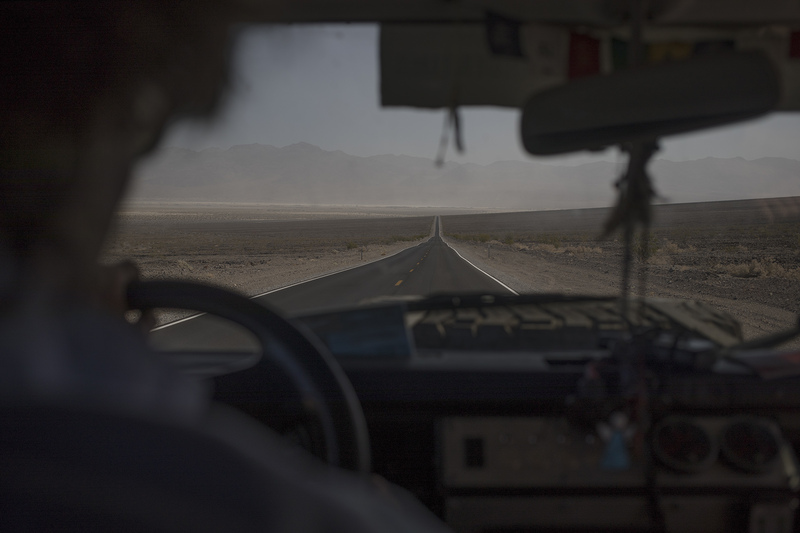 Maciej summed up my weaknesses saying that we were lucky not reaching Death Valley, because I would have just melted”. The towing truck driven by Josh Lanoye, arrived shortly after 1 in the afternoon. A few days later, after a careful inspection of the vehicle’s condition, the verdict was settled – without replacing the engine, Defe would not go any further. 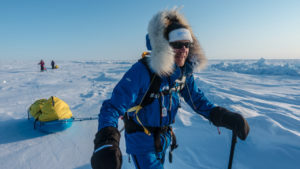 “After 262 days of traveling, we are stopping our journey and returning to Poland” said Michal, emphasizing that it does not mean the end of the expedition. “Defe stays in the US. Meanwhile, while back in Poland, we will find a replacement engine and arrange its transport to Los Angeles. In April or May next year we will return to the States to continue our trip to Alaska. The breakdown of the truck, along with the complicated process of its repair and the expected deteriorating weather conditions in Alaska, hampered meeting their deadlines. Michal and Maciej wouldn’t be able to arrive in Alaska until mid-August, at the earliest, when the snow would begin to hinder traveling through this fascinating, deserted and cold land; hence their decision to return for several months to Poland, although it certainly will not be just passive waiting. First, they need to find the right replacement engine for Defe and, if necessary, fix it. Michal and Maciej’s friends from the Polish Land Rover forum have offered help do this. They have declared not only their support in the search for a new heart for Defe and its possible rebuilding, but also help with financial matters through voluntary contributions to the project. Then, the engine will be sent to the United States where Michal and Maciej can count on the invaluable help and support of Steve and his British Car Service. 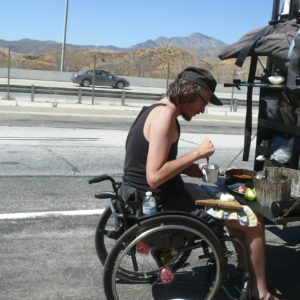 From their first meeting, Steve has been treating the two Polish travelers in an exceptionally supportive way by charging the minimum cost for previous repairs done by his technician Jason Webb, offering free parking for Defe until they return to Los Angeles, and giving his private time to help them. Supposedly, he is even talking to them in a friendlier way than to others. Of course, many people have advised them to sell the car, considering the costs, the multiple repairs, and all the related stress. Michal doesn’t even want to hear all these arguments. “Those who advise that, do not know what Defe means to us. I just love this car”, he confessed recently.” Twice broken, we could see that it was our destiny to deal with those repairs. Without all these obstacles, it might have been too easy, or something else might have happened. That’s what the whole adventure is about. 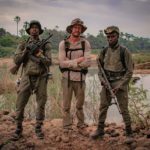 Even if I had to work a long time to pay off the expenses for this adventure, I believe it is worth it”. 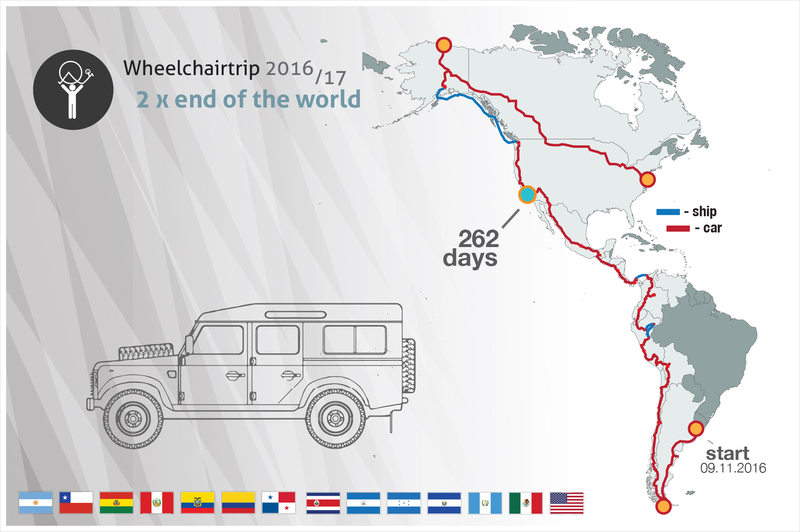 The decision to take a few months off from the Wheelchair expedition was difficult and at the same time easy. It brought a certain amount of disappointment and a certain amount of joy. It caused a lot of mixed feelings and anxiety, but in the end, with confidence and full awareness, it was the best solution. “I am even a little glad we are going back. We will spend a little bit of time of vacation in Poland” says Maciej. “Besides, I have to prepare the house on the island for the winter. That means I need to gather wood, chop it and lay it down for storage. Such is a rural life, and also the haymaking begins. Additionally, I cannot wait to meet a new foal from my neighbor’s mare”. Michal, is a little lost in his thoughts when he talks about his feelings. “On the one hand, I am glad to come back, because it will be nice to rest. On the other hand, I would rather finish this trip, because it is on my mind all the time. This expedition was started in order to be finished and to move on with new things in life. We are extending something that has already been taking quite a long time – two and a half years of preparation, nine months on the road; it is quite a chunk of our lives. After I return to Poland I will not be able to remove myself from this trip for months, because I have to deal with the replacement engine for Defe, and I would like to find some work to earn money for further journey. One thing I am certain of, I will not give up Alaska ”. 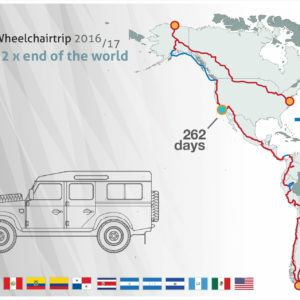 The original goal of the Wheelchair trip expedition has already been achieved, not in 100 percent but in 150 percent, which I made Maciej and Michal realize when they informed me of the need to take a temporary break for a few months. Recall that according to the original plan, which also was the basis for granting them Andrzej Zawada’s Award at the travel festival KOLOSY, the expedition was supposed to end in Costa Rica. 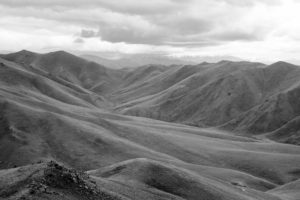 The idea of ​​Alaska flourished somewhere between Argentina and Bolivia, and grew so much on the minds of both travelers that it became an overriding goal for the success of this venture. The end of this part of journey through fourteen countries of the Americas, from Argentina through Chile, Bolivia, Peru, Ecuador, Colombia, Panama, Costa Rica, Nicaragua, Honduras, El Salvador, Guatemala, Mexico and to the United States, calls for some reflection and summary, which simultaneously provide a starting point for the next stage. “Well, saying the truth, we did not do anything special during our trip except dealing with our everyday life. Only that this everyday life was different every day. Every day we were facing something new. It taught us to cope in a variety of situations, also stressful, in which we had not surrendered but we were moving further. This experience proves that being on the trip benefits us”. There were many stressful situations they have survived traveling through South America, Central America and the United States. For Maciej, they primarily concerned vehicle problems, of which the first serious ones appeared in Mexico. 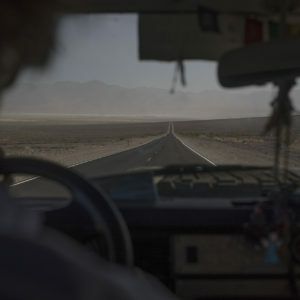 “It is getting hotter every hour, we have no contact with anyone, and we have to cope with something, like finding the way to tow our truck, or brave a twenty-kilometer drive to the mechanic without working brakes on it”, he recalls. Also, quite nerve-racking was their boarding the ship to travel from Pucallpa to Iquitos. Communicating with local people, attentively listening to them to sense what could be the hidden meaning and intentions behind their words, and above all the realization of a task that seemed initially impossible to achieve – the passage on part of the Amazon. 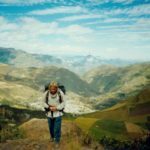 They see the travel from Argentina to the United States primarily as a life lesson, full of new experiences and learning about themselves and the world. Maciej, who is characterized as more pragmatic, claims to have learned …. to speak Spanish and also to react differently to pain and illness. For Michal, his valuable experiences are connected with learning about new cultures. “From previous trips, I was glad the most to recognize that, after returning, I was looking at the things that happened in Poland from a different perspective, because I had the opportunity to see how people see them elsewhere. And that does not mean that we are right or the others are right, just everyone is right”, he recalls. The whole range of new experiences, lessons, and observations that have come from traveling through these fourteen countries, from contacts with people of different nationalities, with different life priorities and values, taught them first and foremost, to enjoy pleasant moments and not to give up in times of trouble. A man can do much if he knows that he wants, can and must do so – they both agree on that. “After 262 days of traveling we are stopping our journey and returning to Poland” said Michal emphasizing that it does not mean the end of the expedition. Alaska is waiting!